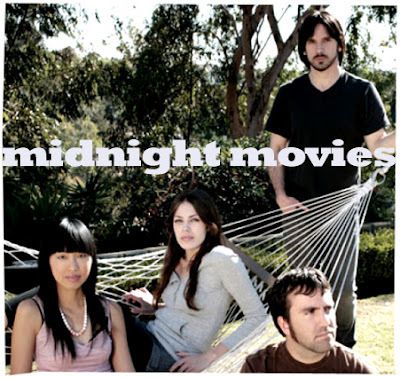 Midnight Movies is a quartet originally from Los Angeles and makes music that falls under the category of dream pop, and dream pop as one would predict is pop music that sounds, well, - dreamy. Dream pop to me, is a more mature version of pop music in general; which would shatter anyone’s perception of pop music, thinking that it’s only confined by the likes of Britney Spears and Christina Aguilera. So, I guess this is a safe bet. Raggedmag described the band as icy, stylish and minimal. Icy because of the lead’s, Gena Olivier’s startling beauty, stylish because the band are comprised of two members who are female and has a great sense of style, no doubt, and minimal, well minimal because of the music – naturally, of course. The band already has an album out last spring titled Lion the Girl. Drummer, Sandra Vu describes the music contained in the album as both big and epic. Do me a favour and enjoy Ribbons.